Recent evidence suggests that capillary pericytes are contractile and play a crucial role in the regulation of microcirculation. However, failure to detect components of the contractile apparatus in capillary pericytes, most notably α-smooth muscle actin (α-SMA), has questioned these findings. Using strategies that allow rapid filamentous-actin (F-actin) fixation (i.e. snap freeze fixation with methanol at −20°C) or prevent F-actin depolymerization (i.e. with F-actin stabilizing agents), we demonstrate that pericytes on mouse retinal capillaries, including those in intermediate and deeper plexus, express α-SMA. Junctional pericytes were more frequently α-SMA-positive relative to pericytes on linear capillary segments. Intravitreal administration of short interfering RNA (α-SMA-siRNA) suppressed α-SMA expression preferentially in high order branch capillary pericytes, confirming the existence of a smaller pool of α-SMA in distal capillary pericytes that is quickly lost by depolymerization. We conclude that capillary pericytes do express α-SMA, which rapidly depolymerizes during tissue fixation thus evading detection by immunolabeling. Blood vessels in animals’ bodies are highly organized. The large blood vessels from the heart branch to smaller vessels that are spread throughout the tissues. The smallest vessels, the capillaries, allow oxygen and nutrients to pass from the blood to nearby cells in tissues. Some capillaries, including those at the back of the eye (in the retina) and those in the brain, change their diameter in response to activity in the nervous system. This allows more or less oxygen and nutrients to be delivered to match these tissues’ demands. However, unlike for larger blood vessels, how capillaries constrict or dilate is debated. While large vessels are encircled by smooth muscle cells, capillaries are instead surrounded by muscle-like cells called pericytes, and some scientists have suggested that it is these cells that contract to narrow the diameter of a capillary or relax to widen it. However, other researchers have questioned this explanation. This is mostly because several laboratories could not detect the proteins that would be needed for contraction within these pericytes – the most notable of which is a protein called α-smooth muscle actin (or α-SMA for short). Alarcon-Martinez, Yilmaz-Ozcan et al. hypothesized that the way samples are usually prepared for analysis was causing the α-SMA to be degraded before it could be detected. To test this hypothesis, they used different methods to fix and preserve capillaries and pericytes in samples taken from the retinas of mice. When the tissue samples were immediately frozen with ice-cold methanol instead of a more standard formaldehyde solution, α-SMA could be detected at much higher levels in the capillary pericytes. Treating samples with a toxin called phalloidin, which stabilizes filaments of actin, also made α-SMA more readily visible. When α-SMA was experimentally depleted from the mouse retinas, the capillary pericytes were more affected than the larger blood vessels. This finding supports the idea that the pericytes contain, and rely upon, only a small amount of α-SMA. Finding α-SMA in capillary pericytes may explain how these small blood vessels can change their diameter. Future experiments will clarify how these pericytes regulate blood flow at the level of individual capillaries, and may give insights into conditions such as stroke, which is caused by reduced blood flow to the brain. When Rouget first discovered pericytes in 1873, he observed that these cells might serve as contractile entities to regulate microcirculatory blood flow because of their structure and position on microvessels (Rouget, 1873). However, this idea was later challenged based on findings that microcirculatory blood flow is largely regulated by upstream arterioles rich in α-smooth muscle actin (α-SMA), the contractile protein present in vascular smooth muscle cells. A number of studies in the past three decades reported that most capillary pericytes in the central nervous system contained little or no α-SMA, whereas α-SMA was detected in pericytes located on pre-capillary arterioles and post-capillary venules (Bandopadhyay et al., 2001; Nehls and Drenckhahn, 1991; Kur et al., 2012; Kornfield and Newman, 2014; Armulik et al., 2011). In contrast, recent in vitro and in vivo functional studies have demonstrated that a subgroup of capillary pericytes are contractile in the brain and retina, and have the capacity to regulate the microcirculation by contracting and relaxing in response to physiological (i.e. neurovascular coupling) as well as pharmacological stimuli (Kornfield and Newman, 2014; Hall et al., 2014; Peppiatt et al., 2006; Fernández-Klett et al., 2010). Importantly, Hall et al. showed that capillaries covered by pericytes dilate before arte-rioles in response to neuronal stimulus in situ (Hall et al., 2014). Recently, an increase in astrocytic calcium was shown to mediate brain capillary changes in response to metabolic demand (Mishra et al., 2016). Similarly, Biesecker et al. showed that calcium signaling in Müller cell endfeet was sufficient to evoke capillary dilation in the retina (Biesecker et al., 2016). Kisler et al. reported that transgenic mice with a decreased number of pericytes had deficient neurovascular coupling and reduced oxygen delivery to the brain (Kisler et al., 2017), providing additional evidence for the importance of pericytes in blood flow regulation. Collectively, these experiments strongly suggest the presence of a bona fide contractile machinery in capillary pericytes. However, a recent paper dismisses the idea of pericytes being contractile by redefining α-SMA-expressing pericytes as smooth muscle cells (Hill et al., 2015). To address this paradox between functional and histological findings, we hypothesized that small amounts of α-SMA in capillary pericytes may be rapidly depolymerized during transcardial perfusion and fixation thus evading detection by immunolabeling. Consistent with this idea, α-SMA in pericytes has been detected by electron microscopy in which small amounts of α-SMA can be identified (Toribatake et al., 1997; Le Beux and Willemot, 1978; Ho, 1985; Nakano et al., 2000) or by in vitro studies in which fixation is more rapidly achieved (Herman and D'Amore, 1985). Here, we show that when filamentous-actin (F-actin) depolymerization was prevented by F-actin stabilizing agents or by snap fixation, we detected α-SMA in a much larger fraction of microvascular pericytes, including capillary pericytes placed on the intermediate and deeper retinal vascular beds. To elucidate the current controversy on the presence of α-SMA in capillary pericytes and to test the hypothesis that low α-SMA immunoreactivity in pericytes could stem from a preparation artifact (Figure 1), we first examined F-actin protein expression in capillary pericytes using fluorescently-tagged phalloidin. Intriguingly, we found substantial F-actin in pericyte processes surrounding capillaries (Figure 1—figure supplement 1A–D). Encouraged by this observation, we tested several fixation methods to enhance α-SMA detection. 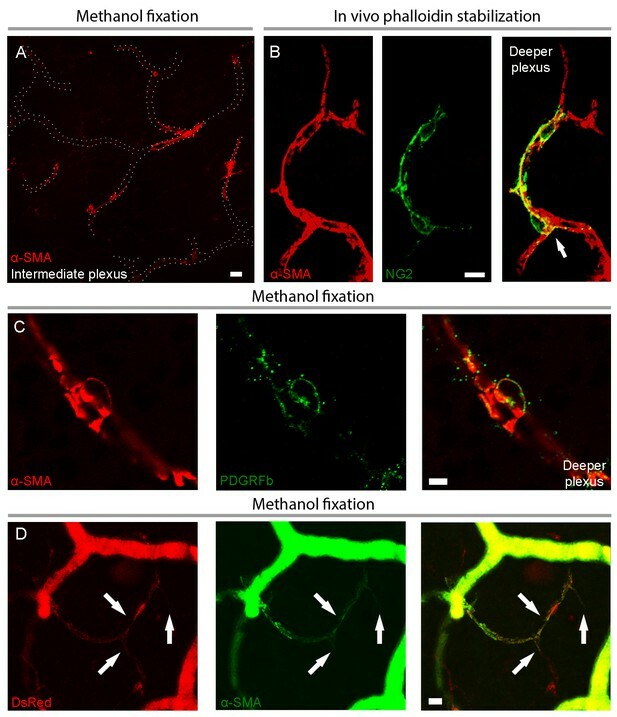 Snap freeze fixation of retinas with methanol at −20°C, yielded almost twice as many α-SMA-immunopositive microvessels compared to paraformaldehyde (PFA) fixation (Methanol: 441 ± 28 vessels, PFA: 254 ± 63 vessels, p=0.023; ANOVA) (Supplementary file 1; Figures 1A–B, 2A, C–D and 3A–C). The number of α-SMA-labeled microvessels significantly increased in fourth order capillaries (Methanol: 144 ± 19 vessels, PFA: 60 ± 28 vessels, p=0.003; ANOVA) (Figures 1A–B, 2A, C–D and 3A–C). 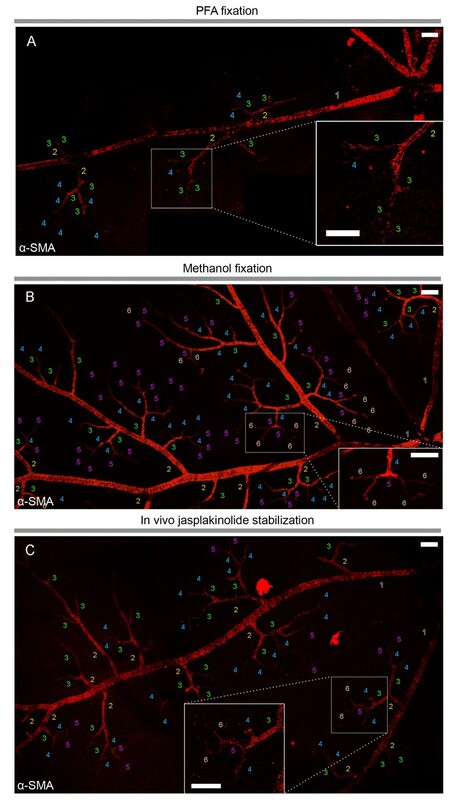 Ethanol fixation did not improve α-SMA immunostaining (Figure 1—figure supplement 2A–B), suggesting that the effect of methanol was likely due to a faster fixation and not the result of a nonspecific response (e.g. protein denaturation). No immunoreactivity was observed in negative controls when the anti-α-SMA primary antibody was omitted (Figure 2—figure supplement 1A–B). In addition to their typical bump-on-a-log appearance detected by lectin, the α-SMA-positive pericytes on capillaries were identified by NG2 or PDGRFβ co-immunolabeling (Figure 2B–C), or by their red fluorescence in NG2-DsRed mice, a transgenic line that allows selective visualization of pericytes (Figure 2D). α-smooth-muscle actin expression in retinal capillary pericytes can be visualized after rapid tissue fixation or inhibition of actin depolymerization. (A–C) The panoramic montage of confocal images of whole–mount retinas illustrate α-SMA immunolabeling of the retinal vessels after PFA (A) or −20°C methanol fixation (B), or using specific F-actin fixing agent, jasplakinolide (C). Each microvessel is numbered corresponding to its branching order. Insets show the microvessels in the boxed areas in detail. Faster fixation of retinas with methanol at −20o or inhibition of actin depolymerization shows clear α-SMA immunoreactivity (red fluorescence) in sixth order microvessels, whereas with PFA fixation, α-SMA expression could be visualized only down to fourth order branches. Scale bars, 40 μm. Capillary pericytes in intermediate and deeper retinal layers express α-SMA. (A) α-SMA expression in the intermediate plexus capillaries after methanol fixation. Note circular pattern of α-SMA staining wrapping a capillary in a junctional pericyte (see the Figure 2—video 1 for z-stacks of this image). Scale bar: 10 μm. (B) Prevention of α-SMA depolymerization in vivo with phalloidin treatment revealed robust α-SMA expression in NG2 positive pericytes also on the deeper plexus capillaries. Note circular α-SMA staining in junctional pericytes, wrapping the capillary wall (arrow). Scale bar: 10 μm. (C) Colocalization of α-SMA with PDGFRβ immunoreactivity in a deeper plexus capillary pericyte. Scale bar: 5 μm. D) Colocalization of α-SMA immunoreactivity with DsRed fluorescence in several deeper plexus capillary pericytes (arrows) in a retina from an NG2-DsRed transgenic mouse. The focus was adjusted to visualize the deep layer in this image; hence the superficial vessels lack morphological details and appear diffuse. C and D were captured from retinas fixed with methanol. Scale bar: 10 μm. Quantification of α-SMA-positive capillary pericytes by vessel order, fixation method and retinal layers. (A) Number of α-SMA-positive vessels per retina by the branching order. α-SMA immunostaining was mainly limited to the first four order vessels after PFA fixation (n = 6). In contrast, methanol fixation (n = 5) and phalloidin (n = 5) or jasplakinolide stabilization (n = 3) allowed visualization of α-SMA expression in downstream branches (p<0.05; ANOVA followed by Dunnett’s test). Phalloidin and jasplakinolide were especially effective in revealing α-SMA expression in 7th order capillaries, suggesting that their small α-SMA pool rapidly depolymerizes during tissue processing (p=0.002, ANOVA followed by Dunnett’s test). (B) Total number of NG2 as well as α-SMA + microvessels on each whole-mount retina detected with different fixation methods (PFA: n = 3, 509 ± 30.5 pericytes; methanol: n = 3, 883 ± 56.1 pericytes; phalloidin: n = 3, 890 ± 138.2 pericytes, p=0.035; ANOVA followed by Dunnett’s test). (C) Illustrates the number of α-SMA-positive pericytes for each retinal vascular plexus. 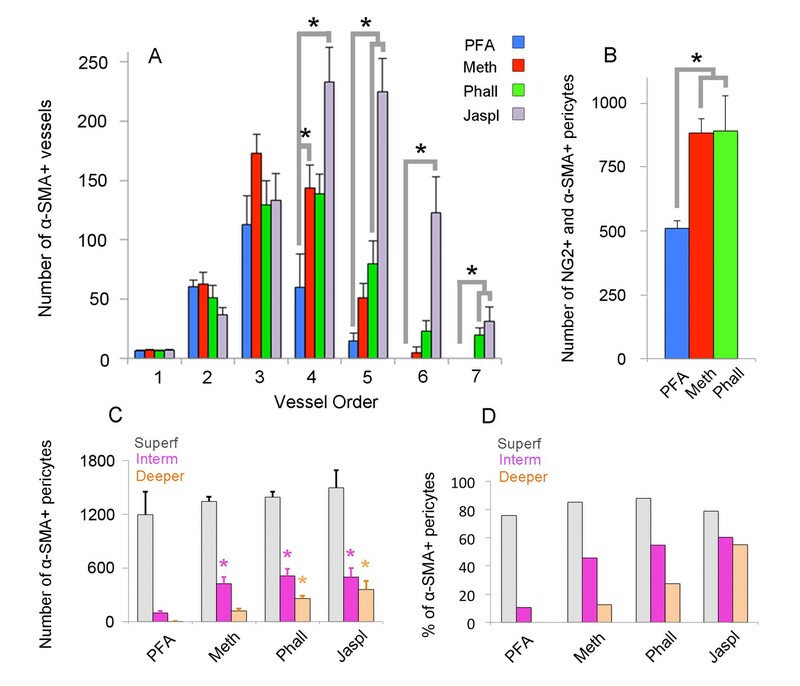 Methanol, phalloidin and jasplakinolide were effective in disclosing α-SMA expression in pericytes located in intermediate plexus (PFA: n = 3, 97 ± 22.7 vs. methanol: n = 3, 424 ± 71.6, phalloidin: n = 3, 509 ± 78.5, jasplakinolide: n = 3, 497 ± 99.5 pericytes respectively, p=0.03; ANOVA followed by Dunnett’s test), and especially, phalloidin and jasplakinolide were effective to disclose within the deeper plexus (PFA: n = 3, 4 ± 2.7 vs. methanol: n = 3, 119 ± 27.2, phalloidin: n = 3, 260 ± 29.8, jasplakinolide: n = 3, 359 ± 95.7 pericytes respectively, p=0.01; ANOVA followed by Dunnett’s test). (D) Illustrates the percentage of α-SMA-positive to total DsRed-NG2-positive pericytes for each retinal vascular plexus in DsRed mice (PFA: n = 3, superficial, intermediate, and deeper: 75.7%, 10.4%, 0.4%; methanol: n = 3, 85.1%, 45.8%, 12.5%; phalloidin: n = 3, 87.9%, 54.9%, 27.3%; jasplakinolide: n = 3, 78.7%, 60.4%, 55.0%). *p≤0.05. (Meth: methanol at −20°C; Phall: Phalloidin, Jaspl: Jasplakinolide, interm: intermediate, superf: superficial). To assess the potential contribution of γ-actin cross-reactivity to α-SMA immunolabeling (Grant et al., 2017), especially under fixation conditions that might perturb the equilibrium between different actin isoforms, we used a specific antibody against γ-actin after snap freeze fixation of retinas with methanol. Most of the γ-actin immunostaining ran longitudinally, parallel to the capillary and pericyte plasma membrane, unlike the circular α-SMA outlining the pericyte somata and processes around the capillaries (Figure 4A–G). We did not detect any γ-actin immunostaining in pericytes on capillaries after the 4th branch. We did not observe a redistribution of the immunostaining patterns of the two actin isoforms when F-actin depolymerization was inhibited with phalloidin (Figure 4D–G). γ-actin immunostaining has a distinct pattern than α-SMA immunostaining. (A–C) γ-actin immunostaining (green) ran longitudinally parallel to the pericyte plasma membrane unlike α-SMA, which showed a circular immunostaining pattern outlining the pericyte processes around the capillaries (red). F-actin fixation with methanol (A–C) or phalloidin (fluorescent-tagged, gray, D) did not change γ-actin and α-SMA distribution in vessels (E–G). Phalloidin was injected into vitreous 2 hr before sacrificing the mouse. Despite phalloidin stabilization of F-actin filaments, γ-actin remained detectable only ≤4th order branches unlike α-SMA. Scale bars: 20 µm. Phalloidin or jasplakinolide binding to F-actin prevents depolymerization and fixes F-actin in the polymerized state (Auinger and Small, 2008; Cooper, 1987; Lee et al., 2010), thus we reasoned that this strategy might enhance detection of α-SMA in retinal capillary pericytes. To test this, retinas were treated with phalloidin or jasplakinolide followed by fixation with methanol. We found that jasplakinolide or phalloidin treatment (Figures 1C, 2B, 3A–D and 5A–C) significantly increased the number of α-SMA-labeling on capillaries of 5th and 6th order compared to PFA fixation (5th order: jasplakinolide = 225 ± 28 vessels, phalloidin = 80 ± 19 vessels, PFA = 15 ± 7 vessels; 6th order: jasplakinolide = 123 ± 30 vessels, phalloidin = 23 ± 9 vessels, PFA = 0 ± 0 vessels, p=0.0001, ANOVA) (Figure 3A). Besides this treatment revealed additional α-SMA-immunolabeling on 7th order capillaries (Figures 2B and 5C) compared to methanol or PFA fixation (jasplakinolide: 31 ± 12 vessels, phalloidin: 20 ± 6 vessels, methanol: 0 ± 0 vessels; PFA: 0 ± 0 vessels, p=0.002; ANOVA) (Figure 3A). α-SMA-positive pericytes identified by methanol fixation or phalloidin treatment also expressed NG2 and their number was significantly higher compared to PFA-fixed retinas (PFA: 509 ± 30 vessels, methanol: 883 ± 56 vessels, phalloidin: 890 ± 138 vessels, p=0.035, ANOVA) (Figure 3B). Prevention of α-SMA depolymerization in vivo with phalloidin or jasplakinolide revealed further α-SMA immunolabeling in high order retinal capillaries. (A), Phalloidin, intravitreally injected for preventing F-actin depolymerization in vivo, was fluorescent-tagged (green) and revealed α-SMA immunolabeling (red) in 6th and 7th order retinal capillaries on whole-mount retinas ex vivo. Scale bar: 40 μm. (B–C) F-actin stabilization in vivo with Jasplakinolide also disclosed α-SMA immunolabeling (red) in 6th and 7th order retinal capillaries, which were visualized with lectin (green). Arrows point to pericyte somas and numbers indicate the branch order. Image in C is surface rendered image. Scale bars: 10 μm. Administration of phalloidin combined with methanol fixation also confirmed abundant α-SMA expression in capillary pericytes of the intermediate (PFA: 97 ± 23 pericytes, methanol: 424 ± 72 pericytes, phalloidin: 509 ± 79 pericytes, jasplakinolide: 497 ± 99 pericytes, p=0.03; ANOVA) and deeper (PFA: 4 ± 2.7 pericytes, methanol: 119 ± 27 pericytes, phalloidin: 260 ± 30 pericytes, jasplakinolide: 359 ± 96 pericytes, p=0.01; ANOVA) retinal plexus (Figures 2A–D and 3C–D, Figure 2—video 1). The vast majority of the α-SMA-positive capillary pericytes could only be visualized after methanol fixation at −20°C (Figures 2A, C–D and 3C–D; Figure 2—video 1) or upon in vivo administration of jasplakinolide or phalloidin (Figures 1C, 2B, 3A and C–D). Of interest, we found that pericytes at the junction of two capillaries (i.e. junctional pericytes) were more frequently α-SMA-positive and exhibited a characteristic circular staining pattern wrapping microvessels. In contrast, pericytes on the linear segment of the capillary, which displayed a helical strand-like staining pattern as reported by other groups (Nehls and Drenckhahn, 1991; Hartmann et al., 2015; Sims, 1986), were less often α-SMA-positive. To further confirm α-SMA expression in pericytes, we sought to selectively reduce α-SMA expression using short interfering RNA (siRNA). α-SMA-siRNA significantly suppressed α-SMA expression in capillary pericytes 48 hr after intravitreal administration, while α-SMA expression in pericytes on upstream capillary branches and arterioles was less affected (Figure 6A–F). These results are in agreement with the idea that a small pool of α-SMA in capillary pericytes is quickly lost by depolymerization, hence making its histological detection difficult relative to α-SMA-rich pericytes on pre-capillary arterioles and vascular smooth muscle cells. α-SMA knockdown by siRNA reduced α-SMA expression. 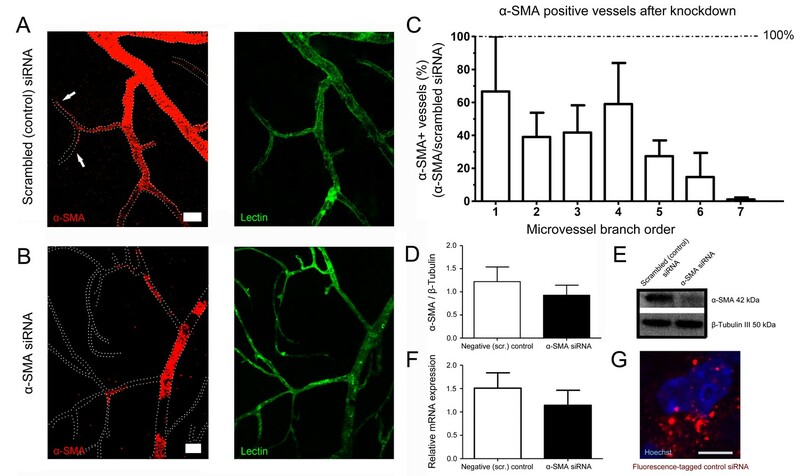 (A–B) α-SMA knockdown by siRNA reduced α-SMA expression, being more effective on capillary pericytes (B) and only partially effective on more proximal microvessels. Scrambled (control) siRNA had no effect on α-SMA expression (A). Note the α-SMA immunostaining extending down to high-order microvessels in A (arrows). All retinas were fixed with methanol snap freezing. Scale bars in A, B = 20 μm. (C) Illustrates the ratio of microvessels with intact α-SMA immunolabeling in α-SMA-siRNA injected retinas to scrambled (control) siRNA-injected retinas (n = 3 per group). The inhibition trend being more prominent on high order branches was statistically significant (p=0.005) with non-parametric Jonckheere-terpstra test for trend analysis. (D–F) Western blotting (D–E) (scrambled-siRNA, n = 3, 1.22 ± 0.32 a.u. ; α-SMA-siRNA, n = 3, 0.93 ± 0.23 a.u., p=0.4; Student’s t-test) and qRT-PCR (F) (scrambled-siRNA, n = 3, 1.51 ± 0.33 a.u. ; α-SMA-siRNA, n = 3, 1.14 ± 0.32 a.u., p=0.7; Student’s t-test) show that both α-SMA protein and α-SMA-mRNA levels were reduced in α-SMA-siRNA injected retinas but the difference did not reach statistical significance possibly because the large amounts of α-SMA in proximal microvessels masked the inhibition in high order branches with small pools of α-SMA. (G) Illustrates the fluorescence-tagged control siRNA distributed in the retina 48 hr after injection (red). Hoechst staining identifies the nuclei. Scale bar, 5 µm. (Scr. : scrambled). In this report, we demonstrate that about 50% of NG2-positive pericytes on high order retinal capillaries (i.e. >5th) located in the intermediate and deeper retinal vascular plexus express α-SMA (Figure 3D). Previous reports relied on α-SMA immunohistochemistry involving the slow transcardial infusion of formaldehyde or PFA fixatives (Thavarajah et al., 2012), thus lack of or weak α-SMA detection was likely due to rapid F-actin depolymerization (Huber et al., 2013) leading to the disruption of the antibody-binding sites (Dudnakova et al., 2010). Although antigen retrieval on PFA-fixed retinas revealed some α-SMA labeling in retinal microvessels, this signal was modest and only found in a few capillaries. Here, we show that faster tissue fixation with cold methanol strikingly increased the detection of α-SMA-positive pericytes. It is possible that the detection of the minute pool of α-SMA in small soma and processes of pericytes does not only depend on the fixation method, but might also be difficult to visualize in transgenic mice due to dispersion of the limited amount of membrane-bound reporter protein over the relatively large surface area of the pericyte membrane. Moreover, incomplete (mosaic-like) fluorescent protein expression after tamoxifen injection in inducible transgenic mice, in which Cre recombinase expression is driven by the α-SMA promoter, can also account for the failure to visualize low levels of α-SMA labeling at capillary pericytes (Hill et al., 2015; Hartmann et al., 2015). Importantly, we demonstrate that inhibition of α-SMA depolymerization in the intact eye using phalloidin or jasplakinolide, two F-actin stabilizing reagents with different pharmacological effects on F-actin, substantially increased visualization of α-SMA in retinal capillary pericytes, particularly those in the deeper retinal plexus. The ratio of α-SMA-positive pericytes was relatively lower to that found in upstream microvessels, consistent with previous reports showing less net O2 delivery from distal capillaries relative to proximal ones (Sakadžić et al., 2014). Interestingly, knocking down α-SMA expression led to the disappearance of α-SMA immunostaining mainly in distal capillary pericytes, suggesting that the small pool of α-SMA in capillary pericytes is less stable than in vascular smooth muscle cells. Based on these findings, we conclude that a large population of pericytes, notably those at branching points of retinal microvessels, have the capacity to express α-SMA, which likely mediates their contraction. It has been suggested that γ-actin might contribute to pericyte contractility in cortical microvessels (Grant et al., 2017). However, our results do not support this hypothesis since we did not detect γ-actin-positive capillary pericytes on distal order branches after preventing F-actin depolymerization. The latter finding also indicates that the increase in α-SMA-positivity after phalloidin or jasplakinolide was not caused by cross-reactivity between the antibodies against γ- and α-isoforms or by accumulation of an excess amount of F-actin that might increase the immunostaining of all isoforms. Unlike peripheral tissues where the blood flow changes homogeneously, the density of pericytes is high in the CNS and retina, where the blood flow demand varies considerably between neighboring cell layers or groups (Kornfield and Newman, 2014; Armulik et al., 2011; Schallek et al., 2011). In vitro studies and recent in vivo brain studies have provided a growing body of evidence that capillary pericytes contract or dilate in response to vasoactive mediators (Peppiatt et al., 2006; Fernández-Klett et al., 2010; Puro, 2007). This blood flow regulation with fine spatial resolution may be essential for tissues with high functional specialization such as the brain and retina. The retinal capillary dilation in response to light stimulus is reportedly layer-specific (Kornfield and Newman, 2014). In line with our findings showing clear α-SMA expression in capillary pericytes of the intermediate plexus, the latter study reported robust capillary dilation in this region, but failed to detect α-SMA expression most likely due to the use of PFA-based fixation (Kornfield and Newman, 2014). A recent study using transgenic mice expressing fluorescent proteins driven by the NG2 or α-SMA promoters also confirmed the contractile capacity of microvascular pericytes in the cortex in vivo, however, it proposed a radical redefinition by classifying the NG2- and α-SMA-expressing (contractile) cells as smooth muscle cells, rather than pericytes, as they would have conventionally been named under the original Zimmermann definition used since 1923 (Hill et al., 2015). The existence of at least three sub-classes of pericytes and transitional forms from smooth muscle cells (Zimmermann, 1923) has been a matter of confusion, emphasizing the need for an unambiguous definition of pericyte sub-classes and their corresponding specialized functions. In conclusion, we identify key components of the contractile machinery in a large population of pericytes in the healthy retina. The identification of α-SMA in capillary pericytes may contribute to clarify the current paradox between functional and histological studies, and expand our understanding of the mechanisms regulating blood flow at the single-capillary level in neurodegenerative conditions including stroke, retinal ischemia, diabetic retinopathy and Alzheimer’s disease. Seventy three Swiss albino (21–35 g), eleven NG2-DsRed (Schallek et al., 2013) mice were housed under diurnal lighting conditions (12 hr darkness and 12 hr light) and fed ad libitum. The number of animals used in each experiment is indicated in the corresponding legend and the Table 1, Supplementary file 1. The table summarizes all agents injected to mice including company, injection site, volume, concentration, vehicle, and number of mice used. Animal housing, care, and application of experimental procedures were all carried out in accordance with the institutional guidelines and approved by the Hacettepe University Animal Experiments Local Ethics Committee (2012/63), committee guidelines on animal resources at the University of Rochester (Rochester, New York), and the guidelines of the Canadian Council on Animal Care and the Centre de Recherche du Centre Hospitalier de l’Université de Montréal (CRCHUM, Montreal, Quebec, Canada). Eyes were collected, fixed for 1 hr in 4% PFA at room temperature, and the retinas prepared as flattened whole-mounts by making four radial cuts (Alarcón-Martínez et al., 2010). Whole retinas were labeled with lectin (20 μg/ml in PBS containing 0.5% Triton X-100 (PBST), Vector Laboratories, Burlingame, CA) or antibodies against neural glial antigen-2 (NG2) (Cspg4) (Millipore, Burllington, MA) and platelet-derived growth factor receptor beta (PDGRFβ) (Pdgrfb) (Abcam, Cambridge, UK). Secondary antibody was anti-rabbit IgG conjugated to Cy2 (Jackson ImmunoResearch, West Grove, PA). Briefly, retinas were permeabilized by freezing and thawing in PBST (−80°C for 15 min, room temperature for 15 min), washed 3 times for 10 min, and incubated in 2% PBST at 4°C overnight. The retinas were washed in PBST 3 times for 5 min, incubated in blocking solution (10% fetal bovine serum or normal goat serum in PBST) for 1 hr at room temperature, and then, incubated with each primary antibody diluted in blocking solution (5 μg/ml) at 4°C overnight. The following day, samples were washed in PBST 3 times for 5 min and incubated with secondary antibody diluted in blocking solution (3 μg/ml) for 4 hr at room temperature. We mounted retinas, vitreal side up, on slides and covered them with anti-fade reagent containing Hoechst-33258 to label cellular nuclei (Molecular Probes, Eugene, OR). Retinas were imaged under a light microscope (400x, Eclipse E600, Nikon Instruments Inc., Melville, NY) equipped with a manually controlled specimen stage for X, Y, and Z-axis, a color camera (model DXM1200, Nikon Instruments Inc.), a fluorescent light source (HB-10104AF, Nikon Instruments Inc.), and an image analysis software (NIS-Elements, Version 3.22, Nikon Instruments Inc.). Confocal images of the stained sections were obtained with a Zeiss LSM-510 confocal laser-scanning microscope equipped with a diode laser 488 nm and 561 nm source for fluorescence illumination, and a Leica TCS SP8 DLS (Leica, Wetzlar, Germany) confocal laser-scanning microscope, with a X-, Y-, and Z-movement controller, and a high-resolution PMT (Zeiss, Oberkochen, Germany) and HyD (Leica) detectors. Panoramic pictures of retina were generated by tiling individual images (20x). Samples were visualized with an Apotome fluorescent microscope (Apotome 2, Zeiss) that allowed optical sectioning and was equipped with an automatic controlled specimen stage for X, Y, and Z-axis, a color camera (Axiocam 509 mono, Zeiss), a fluorescent LED source (X-cite 120LEDmini, Excelitas, Waltham, MA), and an image analysis software (Zen, Zeiss) for image acquisition. After sacrificing the animals, eyes were fixed in PFA at room temperature or −20°C in 100%-methanol for 1 hr. Retinas were collected and permeabilized as described above. Tissue was blocked in 10% normal goat serum in PBST at room temperature. Since anti-α-SMA antibodies are commonly generated in mice (Arnold et al., 2012; Taylor et al., 2010; Cao et al., 2010) to avoid non-specific binding to mouse epitopes of the tissue, first we incubated primary antibody against α-smooth muscle actin (α-SMA) (Acta2) (Sigma, San Louis, MO) separately with monofragments of the secondary antibody (Jackson Immunoresearch, West Grove, PA) for 2 hr (goat anti-mouse, for one retina: 2 µg of primary antibody with 1.5 µg of secondary antibody in 10 µl PBS). Then, we blocked the potential unbound monofragments by adding 200 µl of 10% normal mouse serum in PBS. Then, tissue was blocked (10% normal goat serum in PBS), and by incubation in the customized primary and secondary antibody mixture overnight at 4°C. Retinas were washed and mounted for visualization as described below. To prevent actin depolymerization, F-actin was fixed in vivo by 2 µl intravitreal injection of fluorescence phalloidin (200 U/ml, Biotium, Freemont, CA), non-fluorescent phalloidin oleate (5 µg/µl, Millipore, USA), or Jasplakinolide (10 µM, Abcam, UK). Two hrs later, animals were sacrificed and the eyes were collected and fixed in −20°C methanol for 1 hr. Retinas were harvested and subjected to the α-SMA immunostaining protocol described above. Under 200x magnification, we assigned an order number to each vessel segment before branching, starting from arterioles to capillaries, and the total number and the order of α-SMA-positive vessels was determined for each experimental condition. Under 400x magnification and for each fixation method, the number of α-SMA-positive microvessels in each retinal plexus and the total number of α-SMA+/NG2+ pericytes were quantified using a stereological approach. Thus, we analyzed an average of 140 disectors (field of view: 400 × 300 µm along Z-axis) per retina (same area between animal cohorts). The number of α-SMA-positive pericytes in each retinal plexus and the total number of α-SMA+/NG2+ pericytes were calculated using the fractionator equation as follows: total number of elements = Σ quantified elements/ssf X asf X tsf, where ssf is the section-sampling fraction (ssf = number of sections sampled/total sections), asf is the area-sampling fraction (asf = [a(frame)]/area x-y step between disectors), and tsf is the thick-sampling fraction (tsf = frame height/section thickness) (Leal-Campanario et al., 2017). A custom-designed, in vivo specific, HPLC purified α-SMA-siRNA (siRNA directed against Acta2) and a scrambled silencer select negative control siRNA were purchased (4457308 and 4404020, respectively, Ambion LifeTech, Carlsbad, CA). This α-SMA-siRNA was previously characterized in wound healing experiments in the murine liver (Rockey et al., 2013). Each siRNA was injected into the vitreous using a 34-gauge Hamilton syringe (0.5 mg/ml siRNAs, total volume: 3 µl). Prior to injection, siRNAs were mixed with a transfection reagent to facilitate cell entry in vivo. Briefly, a transfection mixture composed of 3 µl In vivo-jetPEI (PolyPlus transfection, 201–10G, Illkirch-Graffenstaden, France) and 12.5 µl of 10% glucose in 9.5 µl of nuclease free water was added to the nucleic acid mixture (3.76 µl from 25 µg siRNA, 12.5 µl of 10% Glucose in 8.74 µl of nuclease free water), and incubated for 15 min at room temperature. Transfection mixture was prepared fresh before each knockdown experiment. Forty-eight hrs after intraocular siRNA delivery, mice were sacrificed. To check whether or not siRNAs were taken up by the cells, a fluorescent dye conjugated siRNA (BLOCK-iTTM Alexa Fluor 555 Fluorescent control; Thermo Fisher Scientific, Waltham, MA) was mixed with In vivo-jetPEI and delivered to retina as described above. Quantitative RT-PCR siRNA-treated retinas were removed precisely under sterile conditions to eliminate RNase contamination. The samples were stored in RNAlater solution (Qiagen, Hilden, Germany, 76104) at −20°C until RNA isolation. RNAs were extracted with RNeasy Mini Kit (Qiagen, 74104) according to instructions. Five hundred ng of total RNA for each sample was used in cDNA synthesis. cDNA synthesis was performed with random hexamer primers with RevertAid First Strand cDNA Synthesis Kit (Thermo Fisher Scientific, K1621) according to instructions. cDNAs were stored at −20°C. Quantitative RT-PCR was performed with Taqman probe-based technology. Taqman gene expression master mix (ABI, Foster city, CA, 4369016), FAM-MGB labeled Taqman probes for mouse α-SMA gene (Assay ID: Mm00725412_s1) and mouse GAPDH gene (Assay ID: Mm9999991_g1) were used. PCR was carried out in triplicates in ABI OneStep Q RT-PCR machine (ABI). Thermal cyclic conditions were as follows: 50°C for 2 min, 95°C for 10 min followed by 40 cycles of 95°C 15 s, 60°C for 1 min. The relative expression values were calculated with ΔΔCt method. α-SMA expression in scrambled-siRNA delivered retinas (n = 3) was normalized to one fold expression and then α-SMA expression in α-SMA-siRNA delivered retinas (n = 3) was compared according to control siRNA group. Western blot analysis siRNA-treated retinas were removed and protein homogenates were isolated in the presence of a proteinase and phosphatase inhibitor cocktail containing RIPA buffer. Protein concentration was determined by Pierce BCA protein assay kit (Thermo Fisher Scientific, 23225), and 40 μg protein per well was loaded to NuPAGE 4–12% Bis-Tris Protein Gels (Thermo Fisher Scientific, NP0321BOX). Proteins were run and transferred to PVDF membranes, followed by incubation in blocking solution containing 5% BSA solution in TBS containing 0.5% tween-20 (TBST) overnight at 4°C. Blots were incubated with primary α-SMA antibody (2 µg/ml, Sigma, A2547-100UL) diluted in blocking solution for overnight at 4°C then with secondary goat anti-mouse HRP conjugated IgG (0.08 µg/ml, Santa Cruz Biotechnology, Dallas, TX, sc-516102) for 1 hr at room temperature. For loading control, blots were stripped with mild stripping buffer and blocked with 5% fat free milk powder solution in TBST for 1 hr at room temperature, incubated with primary β-tubulin III antibody (0.08 µg/ml, Sigma, USA, T2200) at 4°C for 20 min then with secondary goat anti-rabbit HRP conjugated IgG (0.05 µg/ml, Santa Cruz Biotechnology, sc-2357) for 30 min at room temperature. Bound antibodies were detected with SuperSignal West Femto Maximum Sensitivity Substrate Kit (Thermo Fisher Scientific, 34095). Densitometric analyses were performed with ImageJ software. After extraction of whole-mount retinas, they were immunostained for α-SMA. Microvessels exhibiting continues α-SMA positivity in the superficial layer of whole mount retinas were counted based on capillary order. Counts were normalized compared to the α-SMA positive microvessel counts from scrambled-siRNA delivered retinas. All values are provided as the mean ±standard error of the mean (SEM). We evaluated all cohorts with normality (Shapiro-Wilk test) and variance (F-test) tests. For multiple comparisons of values of the stereological quantifications, we used Analysis of Variance (ANOVA) followed by Dunnett’s or Tukey’s test where appropriate. p≤0.05 was considered significant. For Western blot and qRT-PCR, two-tailed Student’s t-test was applied for statistical analysis. To analyze the α-SMA expression relative to capillary order, we used the specific non-parametric Jonckheere-terpstra test for trend analysis. Methods in Cell Biology 88:257–272. The Journal of Neuroscience 36:9435–9445. The Journal of Cell Biology 105:1473–1478. Journal of Cerebral Blood Flow and Metabolism : Official Journal of the International Society of Cerebral Blood Flow and Metabolism, 271678X17732229. The Journal of Cell Biology 101:43–52. Ultrastructure of cerebellar capillary hemangioblastoma IV. Pericytes and their relationship to endothelial cells. Progress in Retinal and Eye Research 31:377–406. Journal of Physics: Condensed Matter 22:194115. The Journal of Cell Biology 113:147–154. Arch Physiol Norm Path 5:603–663. Investigative Opthalmology & Visual Science 54:8237–8250. Investigative Opthalmology & Visual Science 52:1325–1335. Journal of Oral and Maxillofacial Pathology 16:400–405. Zeitschrift Für Anatomie Und Entwicklungsgeschichte 68:29–109. Thank you for submitting your work entitled "Pericytes Express α-SMA and Contract During Ischemia due to Failure of Glial Metabolic Support" for consideration by eLife. Your article has been reviewed by three peer reviewers, and the evaluation has been overseen by a Senior Editor. The following individuals involved in review of your submission have agreed to reveal their identity: Eric Newman (Reviewer #3). Our decision has been reached after an extensive consultation between the reviewers. Based on these discussions and the individual reviews below, we regret to inform you that the combinations of findings as presented are not suitable for publication in eLife. However, all reviewers thought that the component of the manuscript reporting the expression of SMA in pericytes was a significant contribution after attention to the issues raised by the reviewers on that component of the manuscript. However, all reviewers thought that the other components of the manuscript concerning ischemia, calcium handling and gap junctions would require substantial additional experiments beyond the modest revisions that eLife can consider. Thus, we would be willing to consider a resubmitted brief manuscript focused exclusively on the SMA expression components. If you decide to follow that suggestion, please address the SMA-relevant comments of the reviewers. The comments on the other components of the manuscript are included below for your information. We would have a resubmitted brief manuscript focused on the SMA component re-reviewed by one or more of the original reviewers. This paper is of interest because it addresses a key issue in our understanding of how the CNS regulates its energy supply, i.e. the extent to which capillary pericytes (in addition to arterioles) regulate blood flow. As the authors point out, there has been controversy over whether all pericytes express the α-smooth muscle actin that is assumed to regulate their tone. The authors now seem to resolve this by showing that, with appropriate fixation techniques or phalloidin application, actin can be detected in pericytes on capillaries out to the 7th branching order, i.e. almost all capillaries. The paper also suggests that ischemia induces a [Ca] rise in pericytes and that this calcium influx enters pericytes from glial cells via gap junctions. Although [Ca] is expected to rise in pericytes (indeed in all cells) in ischemia, these two parts of the paper are far less convincing. Overall, the α-SMA detection part of the paper is a significant result (although, as explained below, it needs better documentation), but the calcium and gap junction parts are not in a state fit for publication. Thus, the paper needs either very significant work and changes to the text, or the latter sections of the text should simply be deleted. The authors assume that α-SMA is responsible for pericyte contraction, and it is a major result that using fast methanol fixation they can detect it in pericytes on high branching order capillaries. When the same result is obtained by inhibiting actin depolymerization with phalloidin or jasplakinolide the result is less convincing because these agents may be perturbing an equilibrium between the different types of actin, allowing the formation of a significant amount of F-actin that does not usually exist. This should at least be discussed. Furthermore, images need to be shown with the primary α-SMA antibody omitted (they are mentioned at the start of the Results section but not shown). Does the antibody cross react with γ-actin, which Grant & Shih (www.ncbi.nlm.nih.gov/pubmed/28933255) have suggested might mediate pericyte contraction? It is unclear why many of the phenomena reported in the paper are reported using static images rather than by providing a time course. For example in subsection “Retinal ischemia induces α-SMA-dependent sustained pericyte contraction”, is it not possible to provide a graph showing the time course of the reduction of retinal fluorescence and its lack of full recovery? The measurement of ischemia-evoked constrictions of capillaries and their location near pericytes are poorly documented.a) Larger magnification images are needed for the illustrations in Figure 5C and Supplementary Figure 3. In Supplementary Figure 3 are the black regions of the vessel (i) cells in the lumen, or (ii) occlusions?b) Why are there gaps in the claudin labeling?c) When constrictions are said to localize with pericytes, do the authors mean at pericyte somata (none are visible at some of the constricted areas in Supplementary Figure 3B), or within a certain distance of somata (how far?) or do the authors just mean anywhere that they can find NG2 labeling (which may be at most capillary locations! )?d) For the graphs in Figure 5F, where were the diameters measured? Was it at pericyte somata or just at randomly chosen locations? For Figure 5E and G, how exactly is a constricted vessel defined, in order to count it? Exactly what criterion was used to choose where to place the arows in Figure 5C?e) in paragraph two, subsection “Retinal ischemia induces α-SMA-dependent sustained pericyte contraction”, what length of vessel or area of image is being assessed for the cited numbers of constrictions? Is it the same for non-ischemia and ischemia?f) The statement that constrictions colocalize with helical pericyte processes does not seem to be backed up by an image.g) In subsection “Retinal ischemia induces α-SMA-dependent sustained pericyte contraction”: Give the N numbers for the diameter measurements, say when they were measured precisely, and say whether they were measured at pericyte somata or as an average over capillaries.h) Are the control (pre-ischemia) measurements for phalloidin (4.7 microns diameter) significantly different from the 4.15 microns measured in ischemia? Give exact p values (not just p<0.05) comparing pre-ischemia, ischemia and reperfusion, corrected for multiple comparisons.i) In places constrictions are quantified by their number (a rather subjective judgement – what% reduction in diameter implies a constriction?) and in places by the precise diameter. Please give diameter measurements for the experiments using the siRNA and do a statistical analysis to assess whether they differ from the controls. Calcium measurements. These are poorly documented. Neither indicator used is ratiometric (and so may be affected – perhaps diminished in intensity – by ischemia-evoked swelling), and the increase in [Ca] is quantified solely as the number of cells with a value above some threshold level. Either provide a time course for the signal, or explain why one cannot be shown. Carbenoxolone effects.a) The claim that CBX decreases pericyte [Ca] in ischemia would be better shown as a time course of [Ca]i versus time for cells with and without CBX.b) Carbenoxolone is reported to be faintly yellow (Sigma datasheet); does it affect the Ca-sensing dyes used?c) The claim that glial [Ca] rises in CBX needs quantifying properly so that it is not just an anecdote.d) CBX is a famously non-specific drug. Its effects on pericytes may result indirectly from its actions on voltage-gated calcium channels in the retina (www.ncbi.nlm.nih.gov/pubmed/15028741) or on NMDA receptors (www.ncbi.nlm.nih.gov/pubmed/18555495). The suggestion that it prevents Ca influx from glia to pericytes would need far more proof to establish it as plausible. Gap junction labeling: I am not convinced by this, and the issue might be better studied by injecting dye into glia and measuring whether it spreads to the pericytes. In the insets for Figure 3P and 3T, the apparent green label, consisting of parallel lines oriented from the pericyte to the nearby glial cell is apparently interpreted as being gap junctions coupling the two cells. I am 99% convinced that this is an artefact. Long drawn out labeling like this is classically seen in confocal images when the fluorescence saturates the photomultiplier (as the green signal appears to do here), causing its output signal to "hang-up" while the scan moves on to other pixels (the fact that all the green "lines" are in the same direction is consistent with this explanation). I would therefore predict that the inset in Figure 3P has been rotated approximately 25 degrees anti-clockwise from the original scan direction, while that in Figure 3T is roughly aligned with the original scan direction. It would in any case be implausible for the connexins forming a junction linking glia and pericytes to be ~ 5 microns long as those in the inset to Figure 3P appear to be. (Alternatively, it is conceivable that the green line axis is the z axis of the original scans, with poorer resolution, and that the image has been rotated for viewing from the side, but in that case I'd expect similar poor resolution for the red and blue images in the same direction, which does not appear to be the case). Subsection “Mechanisms of ischemia-induced pericyte contraction and pharmacological rescue”, paragraph 2. If the diameter of arterioles can be measured in adenosine, why not measure the diameter of the capillaries near pericytes? The data with DAB support the idea that glial glycogen can delay the effects of ischemia (though not necessarily by affecting Ca movement through gap junctions), but the effect on the time course described in subsection “in vivo visualization of ischemia-induced pericyte constrictions with AOSLO” is anecdotal. If constrictions appear within 30 mins in the presence of DAB, we need a time course provided for their appearance in the absence of DAB (with a measurement at the same 30 min time point), and some kind of statistical analysis, if a rigorous conclusion is to be reached about whether DAB speeds constriction. Figure 3. Can the effect of the siRNA expression on SMA expression be quantified as a function of capillary branch order? 1) There is no good evidence in the literature that the siRNA technique used in Figure 3 works. While a labeled siRNA would be more ideal, the knockdown should at least be quantified. Additionally, the title of Figure 3 should be changed as the data presented is not related to effects of ischemia. 2) In the discussion of the angiograms presented in Figure 4, the authors should discuss whether venule perfusion returned to baseline after recanalization. Presumably, if there is hypoperfusion in capillary beds, the difference should also be seen in the exiting venules. 3) In the text associated with Figure 5, the authors mention a difference between junctional and non-junctional pericytes. This difference should be quantified. 4) In Figure 9, there should be data for at least some of the treatments showing the effect of treatment in the absence of ischemia as well as the effect of the drugs in the recanalized tissue. 5) Also in Figure 9, the increase in gap junctions should be quantified as this is an important piece of data. 6) It should be discussed in the text that phalloidin treatment might also be affecting other cell-types and what consequences that might have in the context of these experiments. 7) In the supplementary materials, there are videos nicely showing post-ischemia arterioles and pre- and post- ischemia capillaries. However, there is no video showing pre-ischemia arterioles. This is an important control so that the reader can visualize the decrease in capillary blood flow in comparison to any change in arteriole flow. 8) The convincingness of the data would be greatly increased by videos showing live contraction of pericytes on capillaries rather than relying on measuring changes in pericyte shape. It is plausible that pericyte contractions on low order vessels change blood flow, a change that is perpetuated into small vessels and causes changes in vessel diameter and pericyte shape. This caveat should at least be addressed in the text. This paper addresses several important issues related to the regulation of blood flow in the CNS. The authors demonstrate conclusively that pericytes surrounding capillaries in the retina contain α-smooth muscle actin and that this actin is responsible for pericyte contraction. This resolves an ongoing controversy, demonstrating that pericytes have the necessary molecular machinery to power vessel constriction. The authors also demonstrate a novel mechanism responsible for contraction of pericytes and constriction of capillaries following ischemia. The authors' findings represent an important advance in our understanding of the mechanisms responsible for blood flow regulation in the healthy and pathological CNS. The paper is well written and the conclusions justified (but see below). Subsection “Mechanisms of ischemia-induced pericyte contraction and pharmacological rescue”. The GCaMP6 demonstration of increased Ca2+ levels in pericytes following ischemia lacks quantification. Please include a quantitative analysis of GCaMP intensity. Figure 9N-Q. Although the imaging results presented are suggestive, they do not establish that ischemia leads to an increased gap junctional coupling between Müller cells and pericytes. The best way to establish coupling would be to show dye coupling between the two cell types using patch pipettes. Without such evidence, the authors must state that their results suggest but do not establish such coupling. The legend for Figure 3 is misleading. The data presented in the figure have nothing to do with ischemia-induced vessel constriction. Figure 6. The authors state that areas of capillary constriction can be detected because blood flow is stalled in these areas. It is not clear to this reviewer how blood flow can be stalled in areas of constriction but still flow in adjacent segments of the same capillary. Flow should be uniform along the entire length of a capillary at any one time. Figure 7. Please state what the red and green labels represent. Thank you for resubmitting your work entitled "Capillary Pericytes Express α-Smooth Muscle Actin and Requires Prevention of F-Actin Depolymerization for Detection" for further consideration at eLife. Your revised article has been favorably evaluated by Gary Westbrook as Senior editor and three reviewers. This manuscript addresses an important issue related to the regulation of blood flow in the CNS. The authors demonstrate conclusively that pericytes surrounding capillaries in the retina contain α-smooth muscle actin. This finding resolves an ongoing controversy, demonstrating that pericytes have the necessary molecular machinery to power vessel constriction. The authors' findings represent an important advance in our understanding of the mechanisms responsible for blood flow regulation in the CNS. The paper is well written and the conclusions justified. We thank the reviewer for his/her constructive comments that gave us the opportunity to improve our manuscript, which we have now shortened to focus on only the α-SMA detection part. We stained methanol-fixed as well as phalloidin pretreated retinal sections with an antibody selective for γ-actin. Most of the γ-actin immunostaining was longitudinally running parallel to the pericyte plasma membrane unlike the complete or incomplete circular staining of α-SMA. We did not observe any redistribution of the immunostaining patterns of the two isoforms after inhibiting F-actin depolymerization with phalloidin (please, see Figure 4 and the second paragraph in the Results). We now illustrate the effect of siRNA on α-SMA protein synthesis in pericytes based on the branch order (please, see Figure 6C and subsection “Short interfering RNA suppresses α-SMA expression in capillary pericytes” in the Results). After siRNA, we could detect almost no α-SMA in 6th and 7th order branches, suggesting that the smaller pool of α-SMA in these pericytes is more vulnerable to RNA interference. […] 1) There is no good evidence in the literature that the siRNA technique used in Figure 3 works. While a labeled siRNA would be more ideal, the knockdown should at least be quantified. Additionally, the title of Figure 3 should be changed as the data presented is not related to effects of ischemia. We now provide Figure 6G, illustrating the distribution of the fluorescent-tagged siRNA (which is commercially available unlike α-SMA siRNA) in the retina 48 hours after intravitreal injection. We also provide Western blot and rtPCR data comparing α-SMA expression in retinas injected with scrambled or α-SMA siRNA (Figure 6D-F). There was a considerable reduction in α-SMA expression in siRNA-treated group; however, the differences did not reach to statistical significance possibly because the rich source of α-SMA in vascular smooth muscle cells of the arterioles and in pericytes of the upstream microvessels was not appreciably affected unlike the capillaries as clearly seen in the IHC staining and in figure illustrating α-SMA knockdown as a function of capillary branch order. We have rephrased the title of Figure 3 (now, Figure 6A-B) legend correctly. We are sorry for this mistake. We thank the reviewer for his very constructive comments. We have now shortened the manuscript to focus on only the α-SMA detection part. We are sorry for this mistake. We have rephrased the title of Figure 3 (now, Figure 6A-B) legend correctly. This manuscript addresses an important issue related to the regulation of blood flow in the CNS. The authors demonstrate conclusively that pericytes surrounding capillaries in the retina contain α-muscle actin. This finding resolves an ongoing controversy, demonstrating that pericytes have the necessary molecular machinery to power vessel constriction. The authors' findings represent an important advance in our understanding of the mechanisms responsible for blood flow regulation in the CNS. The paper is well written and the conclusions justified. – We have added a new panel to Figure 3, showing the percentage of α-SMA positive pericytes for each retinal plexus (panel D). – We have updated the legend of the Figure 3 accordingly. – We have updated the figure citations in the main text. – We have updated Supplementary file 1. We thank Prof. D Williams and Prof. B Merigan for allowing us access to laboratory facilities and resources at the Center for Visual Science - University of Rochester, Prof. Y Gürsoy-Özdemir and Dr. B Dönmez-Demir for technical advice and assistance, Prof. M Hayran for his help in statistical analysis. Animal experimentation: Animal housing, care, and application of experimental procedures were all carried out in accordance with the institutional guidelines and approved by the Hacettepe University Animal Experiments Local Ethics Committee (2012/63), committee guidelines on animal resources at the University of Rochester (Rochester, New York), and the guidelines of the Canadian Council on Animal Care and the Centre de Recherche du Centre Hospitalier de l'Université de Montréal (CRCHUM, Montreal, Quebec, Canada). © 2018, Alarcon-Martinez et al.